When wearing this set, I totally felt like it’s my birthday suite. Haha maybe because my birthday is coming up + its just so darling & unique. 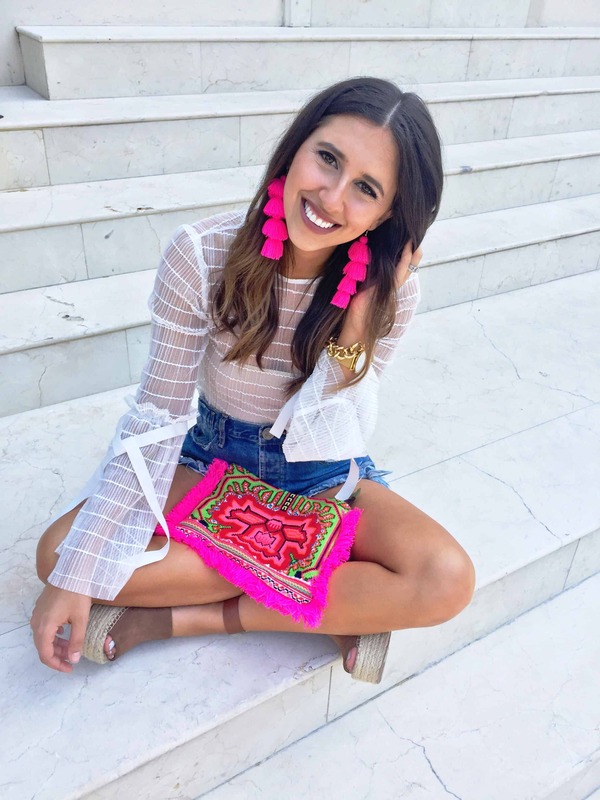 I would so wear this top with some high waisted denim jeans or this skirt with an adorable top but sometimes a set is just as good!I also have been wearing this earring & clutch combo way to much that I probably need to give it a break! BUT can you blame me? How plain would this outfit be with out its accessories. Once I obviously like a trend, I stick and run with it. 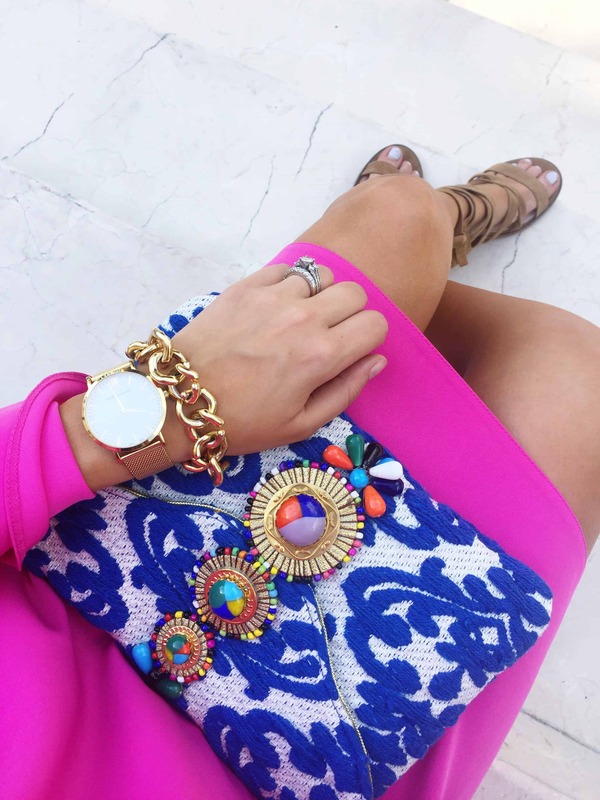 I shared a full round up of my favorite hand bags like this one here. Anyways, happy Friday pumpkins! Thank you for stopping by and for following along on such an eventful week! This weekend I feel like I have a whole lotta nothing. Brunch plans, a hair cut, baby shower, photoshoot oh and we are headed to Lake Charles on Sunday for a guys trip! I usually end up crashing my husbands guys trip bc I think they are so much fun and I hate missing out. I am going to make them celebrate my birthday lol Happy weekend boos! We are in an era where statement / festive bags are becoming the trend. Remember when shoes or earrings use to be the woah factor? Well bags are the new deal and I am round up some that I have been crushing on. I actually have 3 of these bc I obviously have been crushing hard. I will be styling this bag next week and I am so excited how the look turned out. I feel like with any of these bags, your outfits can be endless or simple! Sometimes, letting your bag do the talking in your outfit is just what we need. This one reminds me of crafts time during elementary school and it just makes me smile! Some are a steep price for just a “trendy” bag but then others like this one are under $75! Shop all my crushing picks by using the widget below! Happy Thursday babes! Do you have your eye on a festive bag? I wanna see if you do! I will prob be taking all of mine & some more on my birthday trip next week! Y’all have no idea how much I have been itching for a trip. The condo renovations got us busy in Feb / March so we had to skip our monthly adventure to be adults. This birthday trip can’t come soon enough – ahhh! I have been pondering on this statement all weekend. I am clearly not saving lives or running to be the next President, but I do take my little space of the internet extremely seriously and what I choose to share with you on here. I put a huge pressure on myself to try to be as transparent and honest as I can and sometimes I struggle not being “human enough.” I do not take it lightly that you spend a little part of your day, week, or month passing by to see what I am up too or wearing! That to me is a HUGE deal and that comes with a huge responsibility. I always worry about your response and I know with a blink of a second, you can easily unfollow – that scares the living crap out of me! I always get down when I see an unfollow and think, “like what did I do wrong, why didn’t they like me?” but then I need to remind myself that I am not for everyone! I just wanted to share and be as transparent as I can with you of my thoughts lately! I think my most important role is to only inform you of organic / genuine products that I originally would buy or use myself. This all stems from the pressure of hitting a huge goal in my IG career, and now feeling like every move I make, I want it to be a positive light on your life. I was fearful that me sharing my beauty appointments this week may discourage some and make someone feel like they are not worthy, or they need these kind of things to look a certain way, but let me tell you, that is a lie! I myself know I am perfect in The Lords image and find my confidence in Him. Yes, I do think some areas could improve, but that is nothing that has taken over my life or thoughts. These are just things that I always have wondered and wanted to try (some as small as teeth whitening or a hair cut lol). I will be sharing some appointments on the blog over the next month or so and have LOVED your responses and questions so far! I do want to remind you that you are BEAUTIFUL in His eyes and that is all that should matter. The one who created us. Oh and what is crazy is, I don’t think I have ever wrote or shared something like this before. EEK so many firsts! I have had my eye on some lace up shoes for who knows how long now. I popped into DSW the other day and was so surprised by their selection of sandals and how much I have been missing out on! Obviously for some reason, March has been the highlight of shoes for the history of Dress Up Buttercup and I don’t know what has gotten into me! I never was really into #tuesdayshoesday until recently I have now been understanding. As soon as I took these home, I knew exactly what to pair them with this gingham dress. I was planning on wearing this dress to a baby shower last Saturday but I didn’t end up wearing it for 1 reason – it was too short. I ordered a small and since I was helping host the shower, I knew this dress wouldn’t be practical. If I were to raise my arms, you would be able to see my shorts. Other than that, it is such a unique dress and I LOVE the quality and concept. I would recommend just going up a size and you probably will be fine! How did everyones weekend go? Lately, the time has been flashing before my eyes. I still have so many goals to accomplish by the end of March that I should get to them! Any goals that need to be checked off?